Decribing itself as "the one and only alcohol industry watchdog", Marin Institute is an organization dedicated to highlighting the harms of alcohol. Last week, it rebranded as "Alcohol Justice". The old name was considered "respected but not informative", as its activities aren't limited to Marin, California, and it isn't an "institute" that does research. The press releases provide no further information on the logo, but it clearly includes a person in the middle, made up of the letters O and T.
The introduction of digital terrestrial television in Spain meant that all the existing television networks were given extra space to launch additional channels. For Antena 3, one of the big national networks, this has so far led to the launch of Neox, Nova and Nitro. This week, on July 27, the youth channel launched a completely new graphics package, created at the German motion design studio Luxlotusliner, with ceative direstion from Juan García Segura. The typeface used for the channel name remains unchanged, but the colour scheme changes. 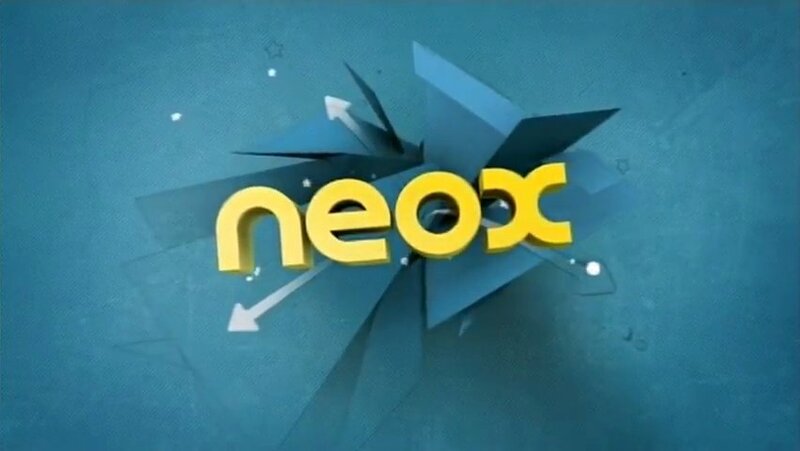 Previously, Neox used a combination of orange, black and white. In the new look, the logo and much of the text that appears on screen will be yellow and shown on teal-blue textured background, reportedly intended to simulate denim. About a month ago, the UK Centre for Medical Research and Innovation (UKCMRI), a planned biomedical resarch centre, changed its name to The Francis Crick Institute, to honour the man credited with discovering the structure of the DNA molecule. At the same time, it adopted a completely new visual identity, and this week the UK design agency Heavenly announced that they were behind it. Heavenly says the "core proposition" for the institute is "The more we connect the more we create", and logo is a visual representation of this. The black square represent the institue and its building, while the coloured tiangles are "people, organisations and skills coming together at the Institute". Sit-up Channels is a British company which operates three shopping channels, that mostly sell items thorough a "falling auction" format, that I can't be bothered to understand. The first channel, then known as Bid-up TV, started in 2000, and was followed by Price-drop TV in 2003 and Speed Auction TV in 2005, all three using some variation of the auction format. This week, the company announced that it was going to change its name to "Bid Shopping" and introduce new consistent looks for all its three channels and the website pricedropper.co.uk. The new look is scheduled to launch on August 1. As you can see, the channel logos are boxes seen from the side. The "TV" suffix has been removed from all channel names. The corporate logo contains miniature four coloured boxes, probably representing the four consumer brands. The previous logos can be seen above. The previous logo was based on logo used by Bid-up TV when it launched in 2000 (with an on-air identity by Kemistry, by the way). Stuffer is a specialised dairy company in South Tyrol in northern Italy. Recently, it unveiled a new look for its Vivita brand, a line of "healthy" dairy products with low fat and added bacterial cultures and vitamins, which includes yoghurts, probiotic drinks and cottage cheese. The new logo includes a measuring tape, to show that the products are ideal "for those who love physical fitness and a natural and healthy lifestyle", but of copurse also to highlight the low percentage of fat. Other than that, the logo remains mostly the same. The new packaging also remains very similar to its predecessor. A press release about the logo change was sent out on July 28, and by then new the packaging had already been in stores for a few days. In March, you could read about the German public broadcaster ZDF rebranding its digital ZDFtheaterkanal as ZDFkultur. In 2009, its documentary channel was replaced by the youth channel ZDFneo. Both were given individual logos that dropped the corporate ZDF logo, but kept the signature orange colour. The only channel not rebranded has been ZDFinfokanal, an 'info channel' with news updates and programmes on current affairs, science, business and culture. That is however about to change, because yesterday, July 27, ZDF unveiled a new look and a new logo for the channel. As previously announced, with the rebrand the channel will officially be named "ZDFinfo", a name which has long been used as a shorthand for the channel. The new look launches on September 5. A new slab serif typeface called Vitesse is used for the logo, and the word "info" is enclosed by a speech bubble. ZDFinfo plans to introduce more porgrammes that allow audience interaction, which may explain the speech bubble. Zaatar w Zeit is a Middle Eastern food retailer with locations in Lebanon, the United Arab Emirates, Kuwait, Jordan and Qatar. In May, it unveiled a new logo, created for them by the London design agency Pearlfisher, who will also work on other aspects of Zaatar w Zeit's communication. The name Zaatar w Zeit translates into "Thyme and Oil". The new logo is a literal interpretation of the name featuring a leaf (thyme) and a drop (oil). In the negative space between leaf and the drop, one can see a Z. The logo was revealed in the middle of May on Zaatar w Zeit's social networking profiles and was preceeded by a social media campaign about the mystery of the "Missing Z". Later reports say that the new look will be rolled out starting July 20. Aker Solutions is an industrial concern based in Norway. In its current form, it was created from a merger between Kværner and Aker Maritime, and was known as Aker Kværner until 2008 when it adopted its current name. Recently, Aker Solutions spun off its EPC activies into a separate company. The working title for this company was "Aker Contractors" until April 6, when it was announced it would be called Kvaerner, resurrecting a company name that had been dormant for a few years. The new corporate identity was created by the Oslo brand agency Brandlab, who got the assignment in January. Kværner has ambitions to appear as an innovative and different company with solid experience. With an established an historical name it was of great significance to create a unique and future-oriented design. The oil and gas business is dominated by profiles in blue, grey and orange. Large images of complex installations and energetic people in hard hats. Kværner wanted to challenge with its design. The logo is iconic and modern, without a disturbing symbol. It underlines the power of the Kværner name and makes the profil practical to implement. The rest of the design is inspired by dynamics of the huge finished installations and Kværner's competence in handling the complexity and to realise them. The colour palette with thin a precise lines underlines precision and competence. The following images were published by BrandLab Oslo. Yesterday, July 26, the American seafood restaurant chain Red Lobster announced a new ad campaign. This announcement also marked the official launch of its new logo. Although the new logo officially replaced the previous one yesterday - for example on Red Lobster's official website and social profiles - it has been around for at least a few months. It was trialled on a newly designed restaurant in Tampa Bay which opened in April. The new logo features a refreshed lobster and new typography. It also includes the phrase "Fresh Fish, Live Lobster". Avia is an Italian aerospace company, which produces parts for both civil and military aircrafts. It was a part of the Fiat Group until 2003, when its was sold to private equity. Yesterday, July 25, Avia launched a new identity yesterday, developed by the Italian design agency Ineditha. The previous logo was introduced when the company separated from Fiat and changed its name from FiatAvio. The double-wings were also used in the last FiatAvio logo. In the new logo, both the wingspans and the wordmark have been given a much needed update. The following quote comes from the press relase provides further information. Last year, the Indian businessman Rama Prasad Goenka announced that his industrial conglomerate RPG Group would be split between his two sons. The part given to his older son, Harsh, keeps the RPG brand name, while the younger brother, Sanjiv, would have to get a new name. Sanjiv's company is called RP-Sanjiv Goenka Group, and has a diverse portfolio, which includes retail chains, music publishers, a carbon black maker, power utilities and infrastructure. The Mumbai agency Design Law & Kenneth was given the assignment to create the new visual identity in April. The result of their work was unveiled and launched on July 13. It includes a colourful symbol called the "Dhanuchakra". Denmark's state broadcaster is called DR, an abbreviation that once stood for "Danmarks Radio". It maintains a strong position on the Danish TV market, and dominates radio listening in the country. A decade ago, DR started investing heavily in digital radio, starting up a bunch of new radio channels, most of them dedicated to specific musical genres. At its height, DR operated over two dozen radio channels, including a bunch of web-only channels. Most of them were "jukebox channels" that broadcast music non-stop without any radio hosts. This year, DR has implemented a new radio strategy which will see the company focus on ten more permanent radio channels that will be mostly presenter-led. Several factors contributed to this change. In the beginning, DR had all the bandwidth on digital radio for themselves, but some of it was later claimed by commercial broadcasters. DR also wanted to have channels that were strong, broad, clearly defined and presenter-led. Furthermore, one of the corporation's four licenses for national FM radio was expiring, and the centre-right government didn't want to extend it, instead preferring to give it to a new private current affairs network. This would mean that DR's talk-based current affairs network P1 and the classical music network P2 would have to share one FM frequency. They would however continue as separate channels on digital radio. Until now, DR's four national FM networks have been DR P1, DR P2, DR P3 and DR P4, where the letter 'P' has historically meant 'programme'. The digital networks have mostly had descriptive names like "DR Jazz", "DR Rock" and "DR Hit", but with the new strategy, most of them will also have the letter P and a digit in their names. DR P5, aimed at older listeners, was launched back in November 2009. DR P6 Beat, with alternative music for the youth, came on April 11, the contemporary pop music station DR P7 Mix followed on June 6, the suite will be completed on September 12, when DR's jazz station DR Jazz becomes DR P8 Jazz. Two channels are excempt from the P-number scheme, the kids channel DR Ramasjang (a radio extension of a brand already used on television) and the youth channel DR Mama. With the new strategy comes a new set of logos for all radio networks. DR has long used a simple template from which all radio channel logos are derived. The previous one was implemented in December 2006 and early 2007 as part of another reorganisation. The European food brand Findus originated in Sweden in the 1940s. Today it is available in many European countries, including the United Kingdom, France, the Nordic countries and some countries in Eastern Europe. It is mostly known for its wide range of frozen food products, but also produces some other products such as soups and marmalade. The multinational food conglomerate Nestlé bought Findus in 1962 and kept it until the year 2000. After that it has been in the hands of venture capital. Since 1971, Findus has used a red and white "flag" as its logo. The "Findus flag" received major refresh in 1987 when it adopted the Crillee typeface it has used until now. It has since been given minor updates, for example a red rectangle behind the flag became a permanent part of the logo in 2001, manifesting itself as a red "strap" or "ribbon" which ran from top to bottom to the right on most packaging. Early this year, the Findus introduced a refreshed logo. The red "ribbon" was dropped and replaced by a less intrusive "background plate". Research had shown that the flag and flagpole were important, and are kept with only minor changes. According to Findus, two agencies were involved in the rebrand, and the final version was created by the Stockholm design agency Pond Innovation & Design, who had previously done some packaging design for Findus. A press release about the logo change was issued on January 26, but packaging with the new logo was already in stores by then. The first product with the new logo were Findus Wok vegetables. Other products will be changed over time and the rollout will progress slowly. This was apparently a summer of rebrands for British museums. For example, the National Maritime Museum introduced a new identity from SomeOne a few weeks ago. Another British museum with a new look is the National Railway Museum in York, which this summer introduced a new visual identity, created by Thompson Brand Partners in Leeds. The agency has also created brand guidelines, but says that the implementation will be done in-house at the museum. Thompson have published a few images were the logo is overlayed on thematic images, showing the strength of a simple logo. Earlier this year, the Australian broadcasting company Southern Cross Media acquired its competitor Austereo. After the deal was finalised, the two companies have been in the process of integrating their activities. Yesterday, July 21, the a new name for the merged company was unveiled. It will be called Southern Cross Austereo. A new logo was unveiled at the same time. It is a combination of the A from the Austereo logo and a very colourful rendition of the star from the Southern Cross Media logo. According to the media site B&T, the colour spectrum represents different business divisions. Grupa Pracuj is Polish company which provides "recruitment solutions", helping companies in Poland and the Ukraine find the employees they need. Yesterday, July 20, the company launched a new corporate identity. The new corporate logo is part of a brand harmonization within the group. The group's most important asset, the job portal pracuj.pl, launched a refreshed logo in June. Other services from the company have also got new matching logos with a common oval shape and typeface. Kabel Eins is one of Germany's ten biggest TV channels with a line-up of mostly American drama series and movies. Today, July 21, it announced that it was about to launch a new look on Saturday, July 23. The new look was created by "Creative Solutions", the in-house agency of Kabel Eins' owner ProSiebenSat.1 Media. Unusually for 2011, kabel eins will also launch a verbal "audio logo", which rhytmically chants "kabel eins, eins, baby". The consolidation of Spanish banks continues. In March we learned that a bunch of regional banks were going to be rebranded as Bankia. This week, on July 19, another such rebrand was unveiled. It is regional savings and loans banks Cajastur, Caja de Extremadura and Caja Cantabria which will unite under the common brand "Liberbank". Together, the banks claim to have 1,200 offices and 20 percent market share. Aimco, or the Apartment Investment and Management Company, owns and operates apartments in the United States. Yesterday, July 19, it unveiled a new logo. The rollout of the new logo continues over the coming months and will include a new website. Last week, a new logo was revealed that can be used by British manufacturers as a seal to help consumers recognise British-made products. The initiative for this logo was taken by Stoves, a British manufacturer of kitchen products, who had found that consumers were confused about the origin of their products. It has since received backing from other British manufacturers and some members of parliament. The logo was selected through a national competition among design students. The winning entry was created by Cynthia Lee, a student at Nottingham University. While the General Mills-owned Pillsbury is a classic American brand, it is relatively unknown outside North America. It can however be seen on products in Germany for a sub-brand called Knack&Back, which means "Crack & Bake" and stands for a products range that started with canned dinner rolls, but has since expanded to croissants and pizza kits. Last year, an updated logo for Knack&Back was introduced as part of a launch of some new products. In addition to a modernized typography, it removes the circular Pillsbury mark from the Knack&Back logo. The Pillsbury doughboy, or "Teigmännchen" as he is called in Germany, is still featured prominently on all packaging and in advertising. The new logo is rolled out slowly, and most products still feature the old one. Yesterday, July 18, the Germany-based international media company Bertelsmann unveiled a new corporate identity, a "powerful" wordmark with blue lettering. The new logo was developed with Peter Schmidt Group in Hamburg, who also created the previous logo. Bertelsmann includes one of Europe's biggest television groups, RTL Group, as well as the book publisher Random House, magazine publisher Gruner + Jahr and the 'media services' company Arvato. The previous logo, which included an orange line of varying length and the slogan "Media Worldwide", was introduced in 2001. With the new branding, "Media Worldwide" has been dropped as it was considered outdated and no longer properly reflecting the company, which has now expanded outside the media field. In addition, Bertelsmann now considers itself a strong international brand that doesn't need added explanations. A new slogan has been selected, "Creativity meets Entrepreneurship", but its use will be more limited and it will not be a part of the logo. The old logo as a graphical element was considered "fragmented, unwieldy and inflexible". The modified Trajan lettering was elegant, but not strong enough. The letterforms used in the new wordmark are custom-made, inspired by the lettering in the previous logo, but stronger and more self-confident. The new logo was launched worldwide on Monday, and revealed on several Bertelsmann branches around the world. According to a press release, Random House and Arvato are altering their identities to fit the corporate rebrand, while RTL Group and Gruner + Jahr will remain as they are. Embraco, a Brazilian manufacturer of refrigeration compressors, unveiled a new logo recently. It is credited to Interbrand. Different values have been incorporated into the letterforms, for example the interlocked 'c' and 'o' should resemble an infinity symbol. A short news article about the rebrand was published by Embraco on July 5, along with a brand page. Zurich is the largest city in Switzerland. Last Thursday, on July 14, a new common brand identity was unveiled which will by used the canton of Zurich, the city of Zurich and the Zurich tourism authority. Included in the identity is a new slogan, "World Class. Swiss Made." and a new logo, which was designed by the Swiss agency Valencia Kommunikation. The new logo marks a "commitment" by the three parties to develop integrated location and destination marketing for Zurich. The tagline should express "The commitment to the highest standards, Swiss quality and reliability". The logo comes in two variants, one with a Swiss cross for "general purposes", and one with the "Goldblume", the Swiss tourism emblem. The blue colour is said to be associated with Zurich. The previous tourism logo included the tagline "Downtown Switzerland" which had allegedly been used for over ten years. Zürism Tourismus is already using the new logo on their website. A more serious marketing effort is planned for September, and will include ads on CNN International. For almost four decades, Sweden was one of few countries in the world with a government run monopoly on pharmacies, banning private retail of pharmaceuticals. When a new centre-right government was elected in 2006, one of its promises was to abolish the monopoly and sell of most of the state-owned pharmacies. This plan was put into action in 2009. Private competition was allowed in late 2009, and a majority of the government-owned pharmacies were rebranded during January and February 2010 as they were transferred to new owners. The newly privatized pharmacies have been grouped into five new chains. There were also a few actors that have entered the market without acquiring any state-owned pharmacies, but many of them quickly realized that the prospects of reaching profitability were bleak. Before privatization, all 945 pharmacies in the country were operated by one state-owned company, Apoteket AB. 615 of them were sold, while 330 stayed with Apoteket AB. 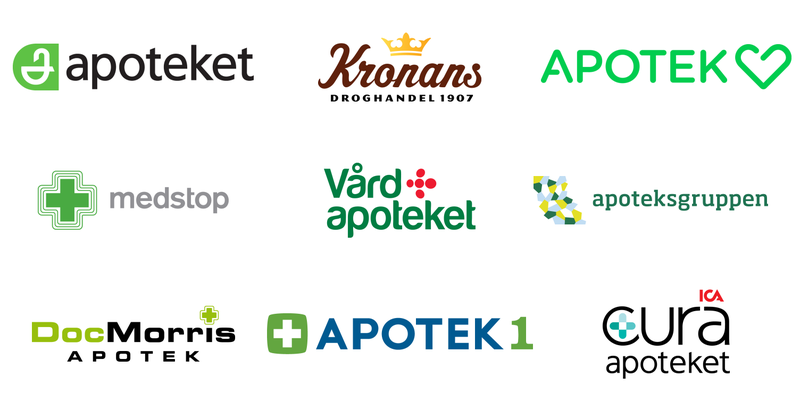 "Apoteket" means "The Pharmacy", and Apoteket AB holds a trademark on the definite form of the Swedish word for pharmacy ("Apoteket"), while the indefinite form ("apotek") can be used by anyone. 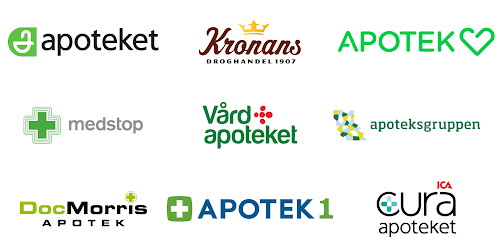 Hence, almost all new entrants have included the word "apotek" in their name. They have also gone for remarkably similar visual identies, with most of them using green as signature colour and some variation of a green cross as their symbol. The old pharmacy logo from the monopoly era. The logo above was used by all pharmacies before deregulation. It contained a very stylized version of the bowl of Hygieia, a snake coiling around a bowl. Apoteket claims this symbol was first introduced in 1972, although it probably went through some minor changes after that. The typeface used above is called Formata. All the new identites after the jump.